My dallies in mothering, crafting, gardening, cats, sewing, baking, business, Daniel Craig, and more. I can't take any credit for this one. 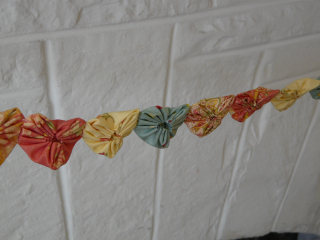 Though I supplied the fabric and the heart yo-yo maker, my mom went to town with the yo-yos and made me this garland. Isn't it lovely? We are in the Valentine's Day spirit around here. Mom and I made wreaths using yo-yos though mine has been made fun of a bit and I won't mention in what way but you can view it for yourself. Aidan and I made hanging paper hearts by cutting out three hearts, folding them in half and gluing each side to another heart. He drew leaves on his - so cute! Aidan's been making presents like crazy and wrapping them to boot. It is kind of exciting! He made me the sweetest valentine, too. Even Mucha and Toulouse are getting in on the action. Valentine pictures here and below. This is a Flickr badge showing public photos from SassyPriscilla tagged with day. Make your own badge here. Ya ha ha ha ha! Mel on Kettle Corn. Um, Kettle YUM.